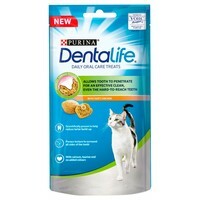 Purina Dentalife Dental Treats are delicious daily dental treats that help to clean your cat’s teeth easily and effectively. Designed with a crunchy and porous texture that will surround all sides of the tooth as your cat bites into it, Dentalife Treats will reach even the hard-to-reach areas of the teeth and help reduce tartar and plaque build-up on their surface. Purina Dentalife Dental Treats have been made with additional calcium and taurine, but contain no added colourants.